i ALMOST bought that yellow makeup case after seeing it in one of my magazines! and now you have made me wish i did! Love these picks – especially your day polishes! love your selection….esp the polish colors! I need to try that Maybelline mascara. Pro make-up artists swear by it so why not give it a go? Great roundup! Love those nail polish colors! These are such great summer products and I love the Cargo shimmer, I have that one in the bronze and it's a great product! Love this list!! I have been rocking orange Essie polish for over a week now. And that lilac color is one of my favorites! Oh how I love summer. Such good picks! I especially like the nail polish you chose! love all the nail polish colors. fun colored nails are a must for me for summer! That mascara is my favorite…and love the nail polish colors! Love your selections 🙂 Definitely agree with your lacquer choices, love orange & lavender! 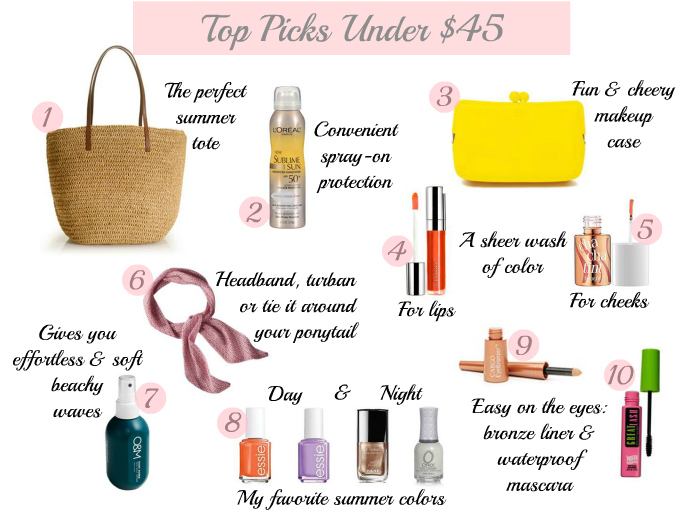 Great picks for summer! I am definitely embracing my natural hair. Check out our new webshop!